Zack gets up in the morning, pricks his finger, and checks the level of his blood sugar. He's one of thousands of kids living with type 1, or juvenile diabetes. His normal blood sugar should be between 110 and 180, but at its highest it was reaching 2,000 and at its lowest, 28. Zack adapted his lifestyle to pricking his finger up to twenty times and day and using insulin injections to keep his blood sugar levels regulated. For many kids living with this condition, it might mean homeschooling, no playdates, or anything that will protect them from a drastic change in their blood sugar levels which lead to diabetic coma or diabetic ketoacidosis. For Zack, it meant he often had trouble attending a full day of school. But that was before Alan, a fox red Labrador puppy and trained diabetes alert dog, a DAD, arrived to live with Zack. Dogs do a lot of sniffing, as any owner who's tried to make short work of a pre-bedtime walk in the rain can attest. But a dog's nose is one of the wonders of the natural world, an organ so sensitive that a a diabetes alert dog can actually detect slight abnormalities in its owner's blood sugar from over three miles away, as his dog Alan did when Zack was off at a football game. Back at home Alan signaled Zack's mom relentlessly to alert her that his blood sugar was dropping. Amazingly, medical dogs have also proven able to sniff out impending seizures, cancer, and life-threatening allergens such as peanuts or shellfish, the dreaded bedbugs, and dangerous hospital bacteria such as C. difficile. With hundreds of millions of sensory neurons on board to analyze every scent in the air, approximately 1000 to 10,000 times more smell-ability than humans, dogs have been useful to man since their wild cousins first adapted to living and hunting with us. And since those early days, we have learned many other ways to use dogs' ability to sense, recall, and analyze smells. 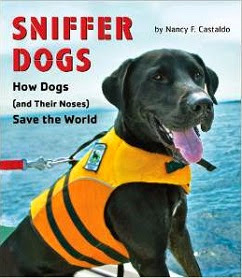 Nancy Castaldo's forthcoming Sniffer Dogs: How Dogs (and Their Noses) Save the World (Houghton Mifflin Harcourt, 2014) documents the many jobs that sniffer dogs do--as search and rescue (SAR) dogs, as military and law enforcement K-9 corps members, as bomb or explosive sniffers, narcotics locators, and as eco-sniffers, able even to locate whales underwater or invasive snails in trees. Being a sniffer dog requires different qualities from those of the usual quiet indoor pet: like other working dogs, good sniffers need a high energy level with a strong urge to play and interact with a handler, a drive to work until they can go no more, and a high intelligence to learn challenging routines. While some sniffer dogs, such as those who search for survivors of earthquakes, landslides, and avalanches, bark to alert their partners, other tasks require atypically un-canine silent alerts--pointing, sitting down motionless, or pawing different places on their handlers' bodies. DAD Alan, for example, prods Zack's knee or shoulder, depending upon whether his blood sugar is falling or rising. Castaldo describes the selection, training, and field work of a variety of such dogs--war dog Eli who detects IEDs in Afghanistan, Sage, the feisty little search-and-rescue who did duty after 9/11, Buford, the relentless live-find bloodhound tracker of criminals, Kura, finder of lost children, eco-dogs, Fargo and Bob, finding endangered whales at sea, and bone-sniffer dogs like Zuma and Jax who can locate decades- or centuries-old human remains in long-forgotten graveyards, wartime crash scenes, or ancient tombs. It is fascinating stuff, written in an engaging narrative just right for middle readers and accessible to dog-lovers of almost any age, with various-sized photographs of the featured dogs at work and inset fact-box bios of these mighty mutts. This is a perfectly executed nonfiction book, from its appealing subject right down to its useful appendix with bibliography of books and articles, listings of web sites, places to visit, "Ways to Get Involved," and a useful glossary. For serious dog fanciers, research report writers, and almost any school or public library, Sniffer Dogs: How Dogs (and Their Noses) Save the World is definitely "Best in Show."